Valutrades is a MetaTrader-only broker, offering a wide variety of forex pairs across its two account types through its UK-regulated entity. Please Note: Valutrades was not included in the 2019 annual review. As a result, this broker's ratings may be outdated. Read our Best Forex Brokers 2019 guide for a look at the top rated forex and CFDs brokers. Valutrades Limited (Valutrades) is a UK-based broker that was established in 2012 and is regulated and authorized by the Financial Conduct Authority (FCA). Valutrades is primarily a MetaTrader-only broker offering the MetaTrader 4 (MT4) and MetaTrader 5 (MT5) suite of platforms developed by MetaQuotes Software Corporation. The broker offers 103 CFD instruments encompassing 74 forex pairs, 11 crypto pairs, 7 metals, and 11 CFDs. Here at ForexBrokers.com, we maintain the largest independent regulatory database available on the web. 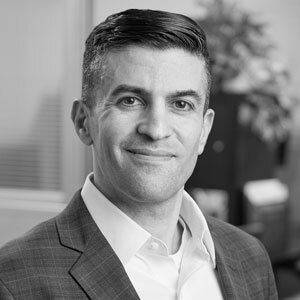 Using 28 different variables, we have created a proprietary 1-100 score (the higher the better) of overall trustworthiness, which we call the Trust Score. Here is our trust summary of Valutrades. The following table summarizes the different investment products available to Valutrades clients. Valutrades offers two account types, the commission-free Standard account and the commission-based ECN account, in which the commission and fees vary. On the ECN account, the broker charges $3 commission per side ($6 per round turn), whereas the Standard account has a 1 pip spread instead of commission. Valutrades provides several research resources, such as a Daily Market Update series and its ValueNewsAlert service. 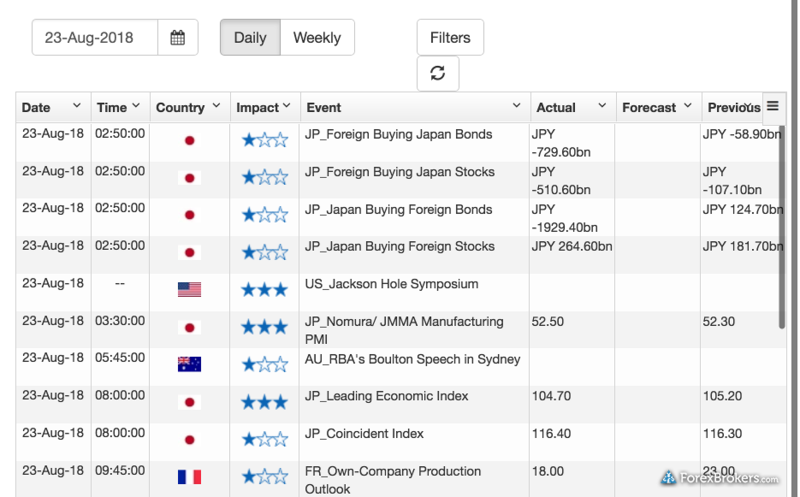 The broker also offers ValuBuilder, powered by TradeWorks, and an economic calendar. 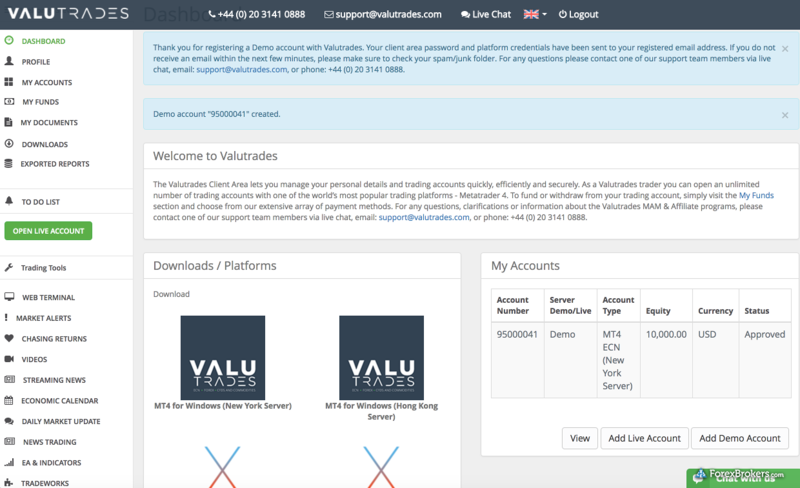 The back office login for Valutrades clients provides access to a research portal with various resources all in one place, under its trading tools section, including the Chasing Returns and TradeWorks indicators. Valutrades’ back office login area has an abundance of easily accessible research and educational content. Valutrades is primarily a MetaTrader broker offering MetaQuotes Software Corporation’s MetaTrader 4 (MT4) and MetaTrader 5 (MT5) suite of platforms. To learn more about MT4, read our MetaTrader guide. Besides its offering of spreads, range of instruments, and account types, Valutrades offers nine custom indicators. Valutrades can be accessed by iOS and Android mobile trading applications, which are available directly from the developers of the MT4 and MT5 platforms on the iTunes Store and Google Play. To learn more about MT4, read our guide to MetaTrader. 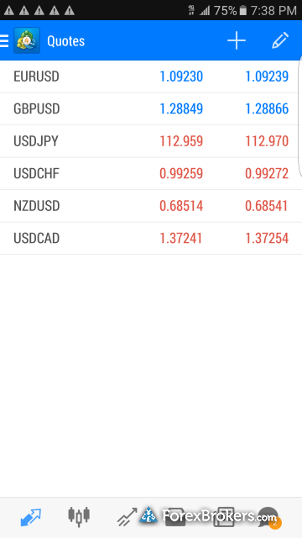 Valutrades also offers the Hummingbird Mobile app, developed by UK-based Hummingbird Limited, which I tested on Android and found it had multiple bugs. The app also crashed on one occasion. The experience on Hummingbird was poor, and multiple ad-like pop-ups made it feel less like a mobile trading app. The charts on the Hummingbird app can be changed to a candlestick format from the default line chart, and there are also two moving averages that can be added by tapping on the chart. However, no information is provided regarding the parameters of the moving averages (such as the period), making them more of a novelty than providing any utility. Valutrades also provides the Virtual Private Server (VPS) service from Beeks and Central Network Services (CNS), two third party companies. Through its UK-regulated entity, Valutrades offers a good deal of research content as a MetaTrader broker, while offering clients a fair range of tradeable products, including 74 forex pairs. While Valutrades offers two account types, we’d like to see the broker provide a breakdown of its average spreads to accurately assess its trading costs. Finally, acquiring a license outside the EU would help Valutrades compete with its peers. Select one or more of these brokers to compare against Valutrades. Find out how Valutrades stacks up against other brokers.